From left, Arnold Mordkin, Markey Butler, Bob Sirkus, Jason Haber, Bill Madsen and Bill Boineau, after a candidate's forum in October. 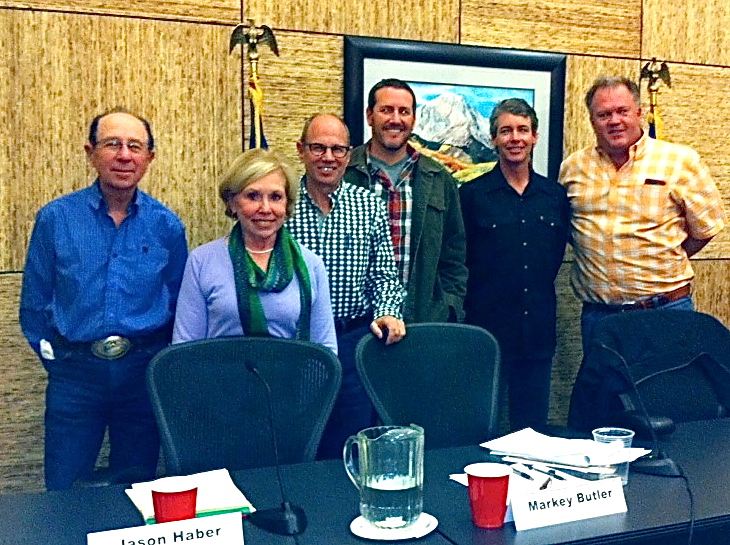 SNOWMASS VILLAGE – Markey Butler took the mayor’s seat in Snowmass Village in Tuesday’s election with 538 votes. She beat out opponents Jason Haber, with 381 votes, and Arnie Mordkin, who garnered 125 votes. “Markey’s decisive, she’s smart and she’ll do what she says,” said Phil Sirianni. In the race for two council seats, planning commission chair Bob Sirkus was the top finisher with 707 votes. Newcomer Bill Madsen won the second seat, with 636 votes. Current mayor Bill Boineau finished third and out of the money, with 486 votes. There will be an appointment for the council seat vacated by Butler. A total of 1,044 Snowmass Village voters participated in this year’s election for mayor. In the council race, 1,829 voters cast their ballots. Among the dozens of attendees at Butler’s election party in Base Village chowing down on burgers, chicken and hot dogs were three Related Colorado employees, including president Dwayne Romero, as well as long-time locals like Wolf and Nancy Gensch and Mary Beth Blake. Up on the Snowmass Village Mall, Haber held forth at a Slopeside Lanes party, which drew a decidedly younger crowd. Befitting Haber’s vegan preference, pizzas adorned with dairy free-cheese and veggies were on the menu. Just after the polls closed, Haber said he was feeling good about his chances because of the endorsements he’d received from both Aspen newspapers, as well as two columnists. Haber had also heard plenty of positive feedback from locals during the last week of his campaign. Sirkus, said the council candidates were far more respectful of each other than those competing for mayor. “I did feel the mayor’s race got a little down and dirty,” said Sirkus. On Tuesday afternoon, Pitkin County Clerk Janice Vos Caudill forecasted a greater turnout for this election than the mid-term election four years ago. Coxon saw that first hand. “It’s been busy today,” she said. That’s something that local Matt Dutcher discovered after work when he came to the polling place. Upon learning that Snowmass Village was due to run through its original 100 in-person ballots by late afternoon, Vos Caudill printed an additional 50 Snowmass-specific ballots which she brought to this voter service center. For more than a decade, local candidates gathered at the Mountain Dragon on the Snowmass Mall to hear election results. The closure of this neutral location forced office-seekers to disperse to private homes, restaurants and the bowling alley. About 50 friends, family members and other supporters gathered at Bill Madsen’s home in the Crossings for spaghetti and meatballs. “It’s been a really interesting and fun process,” said Madsen, who now follows in his father George’s footsteps as a public servant. The elder Madsen served as a Pitkin County commissioner in the 1980s. Editor’s note: Madeleine Osberger is covering Snowmass Village in collaboration with the Aspen Daily News, which published this story on Wednesday, Nov. 5, 2014.